Body Transformation: Living Fit In A New Body! 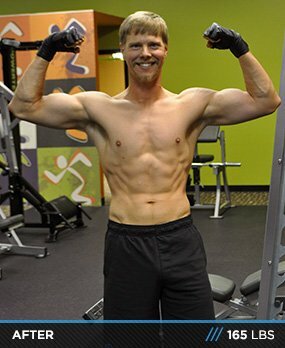 LiveFit became a permanent fixture in Philip's life when his cousin married Jamie Eason Middleton. See how the program transformed his life from the inside out! My gallbladder was removed on New Year's Day 2012. Leading up to and after surgery, I lost 25 pounds due to changes in my diet. The following year was rough. Nothing I ate "agreed" with me and I began to wonder if I was better off after the surgery; not that I had a choice in the matter. A few days prior to Christmas 2012, I pulled my back out bending down to hug my niece. I spent Christmas hunched over like a 90-year-old man who could barely walk. This was the last straw. I knew something had to change. During the second week of January, my cousin, Michael Middleton, visited to introduce the family to his beautiful new bride, Jamie. We spent time catching up and he heard the stories of my ailing back and other health issues, so he challenged me to try Jamie's LiveFit Trainer. He said it was perfect to get me back in shape. 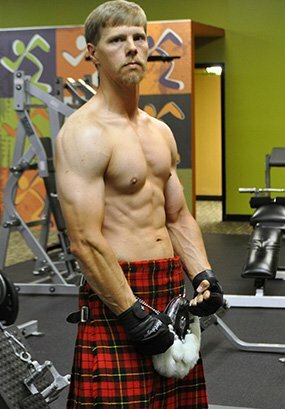 I was skeptical because I hadn't stepped foot in a gym in 12 years. He said the first four weeks of the program contained no cardio, so I decided to look at it. I glanced at the first couple weeks of the program and realized it was similar to the workouts I used to do in my early 20s. Plus, there was a specific meal program to follow with LiveFit, which included many of the same foods I ate leading up to my gallbladder surgery and were even gluten free. My hope was that the program would help me get in shape and help my ailing system. My hopes turned into reality. It took several weeks, but I finally tried the program and went all in. As I progressed, I began to feel better physically and my digestive system began to normalize. Now I feel great. My back doesn't hurt all the time, my digestive system is a much better, and the physical strength I gained is awesome. I never had abs until now. I love what I see and have no intention of going back. There were several obstacles to overcome. The biggest was to create the meal plan. I live in Mississippi and there aren't many natural foods here. Stores have small healthy food sections, and were nothing like what I saw in Jamie's meal plan. I remember thinking that if I walked in and asked for "Orange Roughy" they would probably send me to the household cleaning section. So I sat down and came up with foods that were available to me and built a meal plan from there. The list was short. I ended up ordering things like oat flour and steel cut oats. There was lots of repetitive eating (there's only so much tilapia a man can take), but I stayed focused on the end goal and told myself that "It's only 12 weeks." Another obstacle was saying "no." I live in the South where food is king and committed to a 12-week program in the heart of fish frying and crawfish season. People down here don't take "no" for an answer. "Are you sure you don't want a piece of fish?" "You can have one hush puppy, can't you?" They don't relent. I fortunately had an ace up my sleeve. I played the "gallbladder card." When it's medical, they back off. I was a rock, and now my abs are a rock. It was worth it! I stuck to the LiveFit Trainer. The only modifications came due to a lack of equipment. I couldn't perform seated calf raises, so I did standing calf raises and single-leg calf raises. I also didn't have the Hammer Strength Lat Pull Machine, so I substituted pull-ups. The LiveFit trainer is a simple 3-phase program for transforming your body and your life in 12 short weeks. If I had to choose a favorite regimen from the trainer, it would be Week 4. It was still in the no cardio phase and I enjoy the weight training. Week 4 is also when I began to notice changes in my body. The biggest challenge was to overcome being out of shape and an extremely weak core. The abdominal exercises were excruciating to start. I have scar tissue along my rib cage on my right side from surgery and I experienced severe pain and long-term soreness. By the end of the program, I could see noticeable strength in my core. The other big issue was the MCLs and ACLs in my knees. At about Week 7, they started bothering me. By Week 9, I had to ice my knees after every workout. In Week 9, I used my rest day on Tuesday after finishing an excruciating leg routine the night before. Friday rolled around and it was back to another leg day, but I couldn't do it. I took off that Friday, Saturday, and Sunday to rest my knees and it was the best decision I made. I maintained my diet and started back on Monday of Week 10 with recovered knees and blasted the rest of the program. No more knee pain after that. My long-term goal is to build muscle and get to 185 pounds. Steve Cook is very similar to me in height and structure. His build is the benchmark I'm shooting for. I will use the LiveFit structure and increase my weight. The goal of the program isn't to see how strong you are or what your max weight is. I will spend a week or so testing the limits to see where I stand. Dieting is key. You cannot get the results you're looking for if attempt to "negotiate" changes in the program. Listen to your body. Everyone has strengths and weaknesses. Your body will tell you where yours lie. Take photos. You don't see yourself the way others do. You can look down at yourself and think nothing has changed, but photos tell a completely different story. 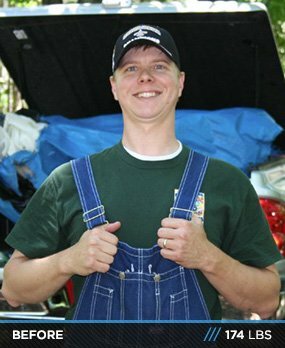 The customer service is unmatched; prompt responses, quick shipping, and quality products. When I order, I truly feel like I'm the most important person to them and I like it. 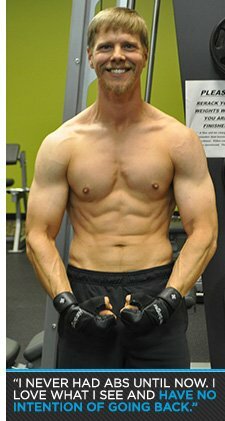 All of my supplements, recipes, and workout gear came from Bodybuilding.com. I spent more time researching recipes, supplements, and clothing on the site in the last three months than I spent on any social networking site. I love it! First and foremost, I want to thank my wife, Brandy, for putting up with me through this transformation and for the muffin pans that she cleaned when I "forgot" too. I would like to thank my cousin, Michael Middleton, for his encouragement before and during the LiveFit program. Last, but not least, I would like to thank Jamie Eason Middleton for her encouragement and vision of a more healthy way to live. Thank you for your passion and for sharing it with the rest of us to improve our quality of life.